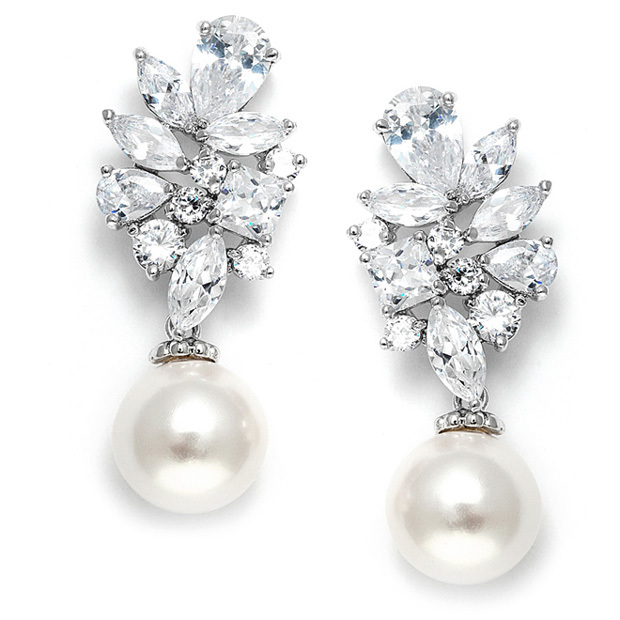 * Mariell combines sophisticated bling with traditional pearls to create our dazzling wedding earrings. * The top of these wholesale earrings is a brilliant cluster of ovals, marquise and round Cubic Zirconia and the drop is a 12mm round soft cream pearl. * These dazzling earring offer your brides the best of both worlds blending extreme sparkle with understated classic pearl drops. * Mariell's Cubic Zirconia wedding earrings are 1 1/2" h x 9/16" w with a bold 12mm Soft Cream round pearl drop. * Our silver rhodium earrings have a gorgeous cluster of ovals, marquise & round CZ's on the top with a simple pearl drop sure to please any bride.